The first concerto is immediately prominent for its use of the two ‘hunting’ horns, those instruments most associated with the privilege of royal courts. Hunting was a particular metaphor in German states, which were basically a multiplicity of small courts (such as that at Cöthen where Bach worked: a small town, castle and – even today – lots of cows). Only the largest states such as Saxony and Prussia had real military pretensions, so the activity of hunting stood in for military might. The horn players (who were normally also the trumpeters) were the highest paid musicians and the more – and the better – a prince could afford, the more sumptuous his court appeared. 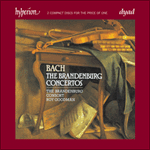 Having said that, this concerto would still work were they to be omitted and this has sometimes been interpreted as a sign of Bach’s critique of social hierarchy (see the work of Michael Marissen, in particular). On the other hand, the horns contribute immensely to the style and ethos of the piece with their unabashed hunting calls. Indeed, Bach seems to have gone out of his way to make the horns clash against the rest of the texture. An oddity about this concerto is the way the balance of the solo instruments seems to change in the course of the piece – perhaps a sign of the diverse origins of the work (an early version survives which lacks the third movement and part of the last). But it might equally represent Bach’s way of demonstrating the diversity and malleability of the genre at the outset of the collection. The piccolo violin (tuned a third higher than the standard string pitch for these concertos) first comes to prominence in the second movement, a beautiful, affecting lament that – with its piquant cross-relations – seems to all but follow a text which lies just beyond our ears. In the third movement the high violin appears in a more virtuosic light, but after this point it disappears again. This movement is also known as the opening chorus of the secular Cantata 207, ‘Vereinigte Zwietracht der wechselnden Saiten’, in which vocal parts seem to have been added to the instrumental texture. However, if Malcolm Boyd’s guess is right, both this and the Brandenburg version might go back to an earlier vocal model. Thus what we hear as the third movement of the first concerto might actually be the instrumental arrangement of a chorus – something which points to the wider concept of ‘concerto’, embracing vocal, as well as instrumental, music. 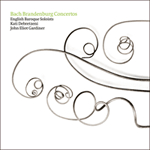 This suggests that we should not think of these concertos purely as abstract, absolute music: their gestures, moods and rhetorical structure should perhaps be seen in a similar light to texted music. The first concerto, uniquely, presents a fourth movement, a set of dances interspersed with repetitions of a French-style minuet. Just as vocal and instrumental genres were closer to one another than we might think, so too were the genres of ‘Italian’ concerto and ‘French’ suite. Not only does the return structure of the minuet parallel the ritornello form of an Italian concerto movement, dances sometimes form the basis of the longer concerto movements (the third movement of this concerto has many of the characteristics of a passepied, that of the sixth concerto is like a gigue).